Last week I was fortunate enough to be one of a select group of journalists to be invited to a Canyon women’s specific bike launch in the south of France. This is kind of a big deal (Ed: the launch, or Amanda? ), as this range is a completely new venture for Canyon. The German direct-to-consumer brand has previously offered women’s models based upon the same frame as the unisex version, but with a few components changed around. These new bikes on the other hand, are being launched with unique frames equipped with women’s specific geometry. 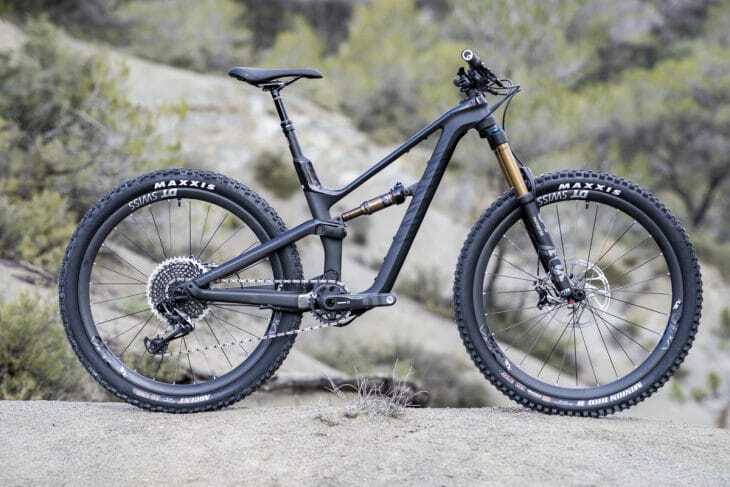 Canyon has also complemented its new bikes with a tonne of research into suspension kinematics to ensure the bike is fully built with female mountain bikers in mind. For me personally, this launch was a new venture in that I have never ridden a women’s specific bike before. 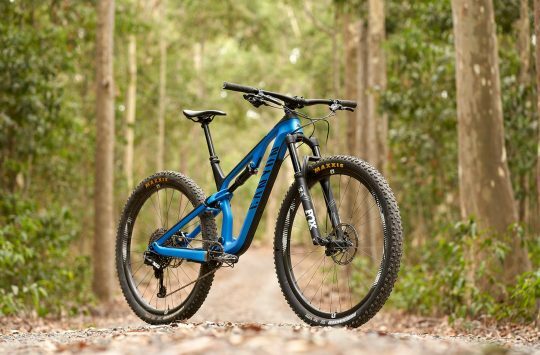 I already own and ride a unisex 27.5in dual suspension trail bike, so I was eager to find out just how different Canyon’s take would be. Given that other big brands including Specialized and Trek have actually been moving away from producing specific frames for female riders, why did Canyon see the need to commit to developing an entirely new range of bikes for women? The key factors taken into consideration are weight, reach and standover height. Extensive research has gone into the geometry and suspension kinematics of this range, with Canyon quoting some 68,000 data points that it has gathered from its own online bike fit database. To summarise Canyon’s findings into three short conclusions: women tend to have a shorter arm reach, are lighter and sit further back on the bike. Shorter reach, shorter bars but not short on performance. The bikes are available in four sizes, 2XS (AL only), XS, S, M. Previously the midpoint of any Canyon range has been the medium, but taking into account the shorter height of the average female rider, Canyon has developed its women’s range around size small, and worked out from there. This is particularly interesting from my perspective. I’m 5’8 (173.5cm) tall and although I have a long torso and arms, I do prefer short bikes as I find them easier to manoeuvre and I can hold a more aggressive stance on the bike without it feeling forced. In general, I tend to go for a medium men’s/unisex bike. When I was handed my medium Spectral test bike it initially felt short. Really short. Of note is that Canyon specs a narrower bar on its women’s models (740mm vs 760mm), and also a shorter stem length (40mm vs 50mm). Combined with the shorter top tube, the overall reach to the grips immediately felt more compact than what I’m used to. Time would tell if this was a good or bad thing. Lower top tube for a low overstand height. The styling of the bike with the smooth lines on the top tube and rear triangle is not just to look good. These underline the low standover height and the shortened reach, a very important aspect of this bike. The reach has been shortened by 10mm to that of the unisex Spectral, as according to research by Canyon the average woman (or perhaps we should say, the average female Canyon customer) is around 13cm shorter than the average man. This shortened reach keeps the rider in an aggressive stance on the bike with their weight forward keeping the traction on the front wheel and compensates for the fact that women tend to have less upper body strength. It also gives the rider more room to manoeuvre. To help even the smallest and slightest of riders position their weight nice and deep into the bike, the smaller frame sizes feature a lowered bottom bracket height, which naturally makes the bike easier to dismount too. High anti-squat and new suspension kinematics give you great traction on the climbs. Like the unisex Spectral that we tested recently, the women’s Spectral draws on the same revised four-bar linkage that sees the rear shock mounted in a horizontal position and anchored halfway up the downtube. This allows the top tube to be lowered to increase standover height while still providing room in the main triangle for a water bottle. 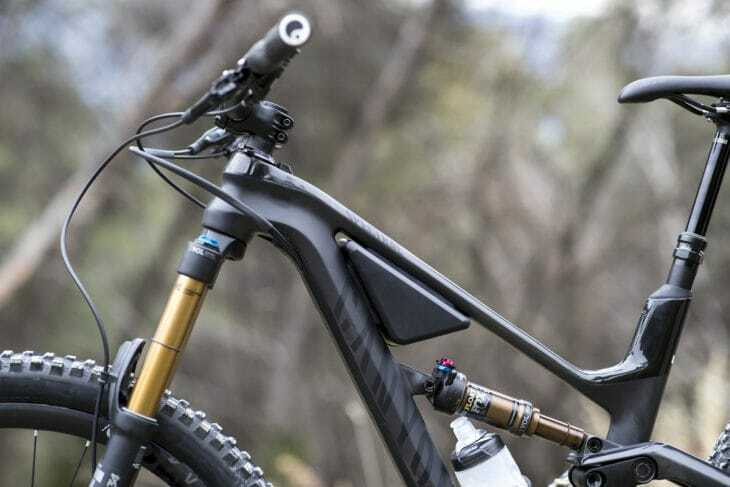 Compared to the old Spectral with its vertically-mounted shock, this new layout improves the stroke of the shock, and thanks to increased anti-squat built into the kinematics, Canyon states the rider will experience more efficient acceleration. 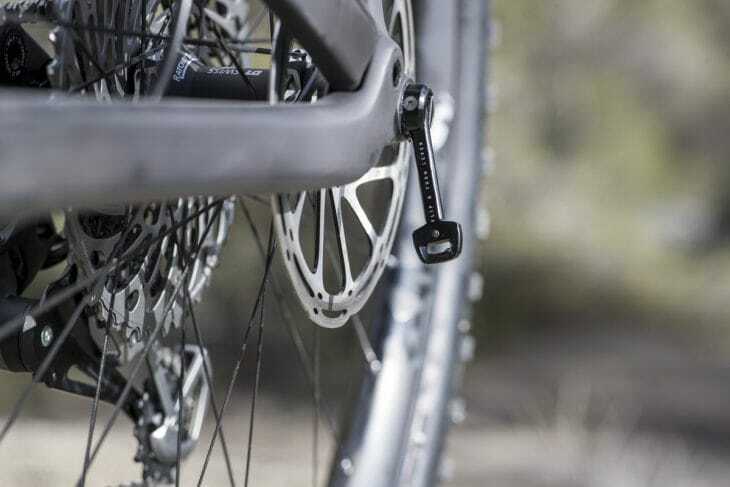 In layman’s terms (thank you Wil), the tension on the chain counteracts the bounce caused when accelerating, reducing the need to lockout the suspension when pedalling along the trail. 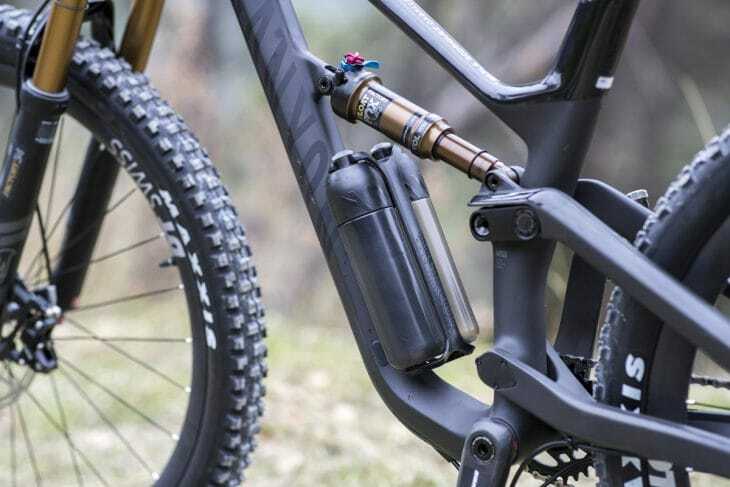 For 2XS and XS frames Canyon introduce the eject system – Two 400ml bottles that leave plenty of room for the new linkage. 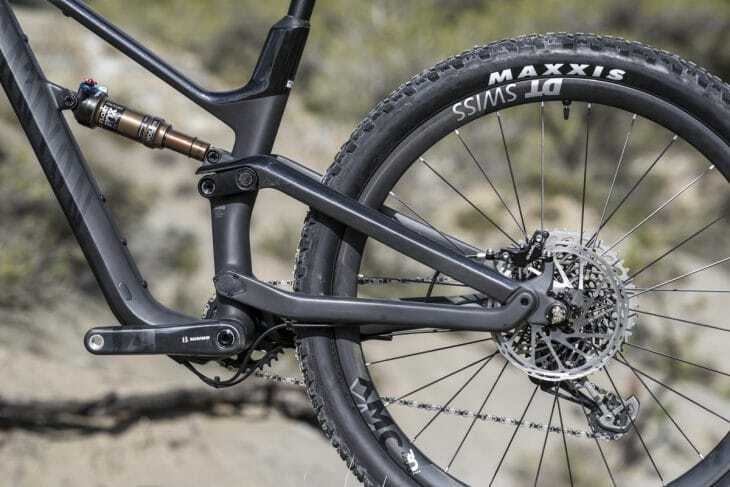 To lower standover height even further, Canyon has employed a specific linkage for the women’s Spectral. There’s still 140mm of rear travel like the unisex version, but the shock itself has a shorter stroke, and it’s also tuned with lighter female riders in mind (around 64kg being Canyon’s average). The result is a leverage curve that is more responsive in the first phase, while still allowing said lighter riders to use all 140mm of travel. End-stroke: For the last third of the travel, the suspension progressively ramps up to give the suspension a bottomless feel, and to avoid you bottoming out the shock on bigger hits. Integrated cable channel doubles as a bash guard. Every consideration has been made towards keeping the frame sleek and tidy, starting with the integrated cable channel – a plastic cover the length of the downtube that protects the cables from the elements and also works as a bash guard. Conveniently the cover is easy to remove for maintenance, meaning you have all the benefits of internal cable routing with the additional bonus of no rattling cables inside. Coupled with the integrated seat post clamp, the bike has a seamless design with a great level of protection against wear and tear. 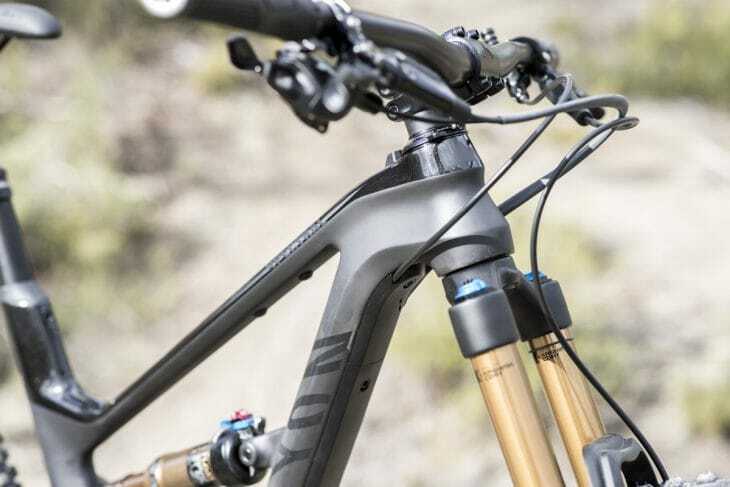 Borrowed from the Exceed carbon hardtail, the Impact Protection Unit (IPU) from Canyon is German engineering at its best. 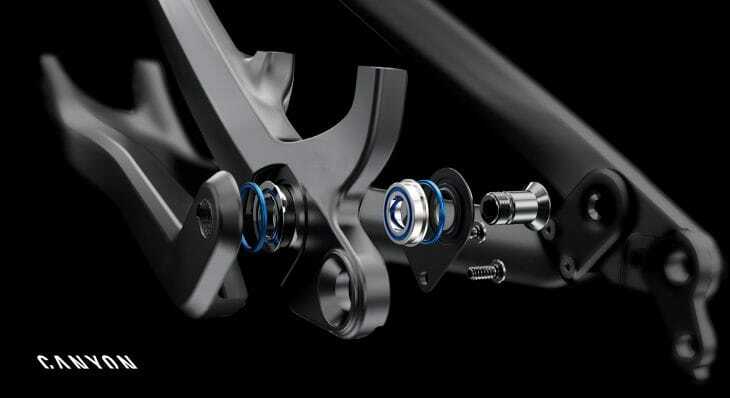 At first glance this is a simple design to act as a limit stop to protect the top tube from damage by the bars. But if the bars were to hit the IPU with extreme force, hollow screws will break and soak up the impact. My only gripe with this feature is purely aesthetic – given that so much effort has been put into the sleek design of the bike it seems a shame to not anodise the screws black. British weather will be no match for the Spectral. To add to this growing list of well-engineered features, Canyon has introduced a new bearing concept. To protect the frame through the seasons each pivot is now armed with fully sealed industrial bearings with additional X-ring seals to fight against premature wear and tear caused by dirt and water sneaking in. There are so many design elements that have been added to extend the life of the bike and protect it against wear and tear, weather and impact. 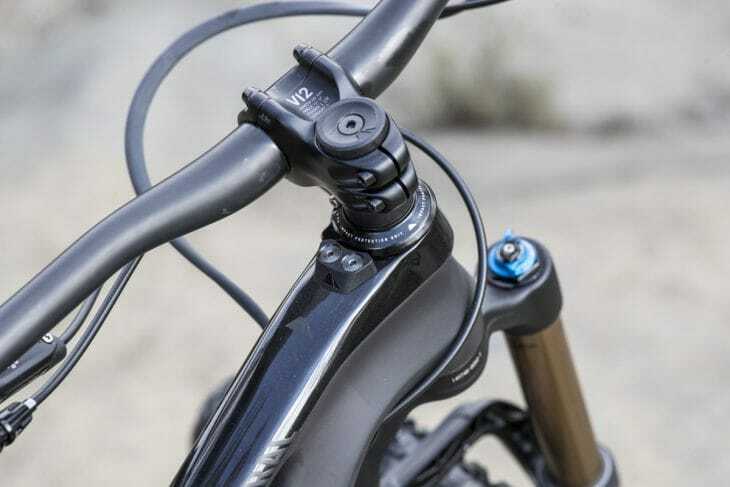 A feature Ines Thoma (one of Canyon’s top-flight enduro racers) is particularly pleased with is the new quick release. The problem: wanting the convenience of a quick release without the lever sitting at the wrong angle when you put it back in. The solution: a pull out lever that folds out for leverage, but is stored neatly within the axle. It’s small details like this which add up and show that so much detail has gone into ensuring the rider has a good experience. In addition to the quick release, the side exit bottle holder and the ingenious cable management, there is also the option of a bolt-on storage box just big enough to hold a spare tube, small tool kit and a ride snack. This option is not available on the 2XS frame as there’s simply not enough room between the top tube and the down tube. I’ll be completely honest here – at 5’8 with long arms I do not fit in with Canyon’s research into the average female rider, with average being the operative word. No, these bikes do not fit every woman but the sizing options have really broadened the market to women giving us four additional sizing options over the unisex range. 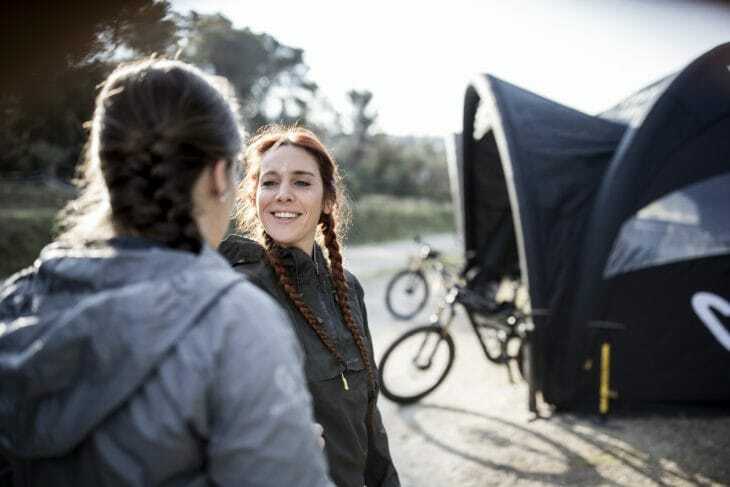 When I initially sat on the bike it felt very short to me, but I soon went from being sat outside the mechanic’s tent wondering if I should shift the saddle a bit further back, to being on the trail with a stupid grin on my face shouting back to one of the other girls that I hadn’t felt confidence like this in a long time. That’s what this bike is to me – confidence inspiring. At no point on the downhills (and there is some VERY technical riding along the south coast of France) did I hesitate or second guess my line choice. Following Ines down a particularly sharp rocky section I didn’t actually look at what I was about to put the bike through, I just clocked the general direction, put my smile on and tried to see if I could catch her up. I couldn’t, but I had fun trying! Keeping in mind that I’ve only spent a day on this bike, albeit a solid 8-hour one, here’s what stood out to me. From the moment we set off I felt like I had complete control of the bike. As I mentioned earlier, it did initially feel short in the reach but as soon as I got it on the trail I found that shortness put me in a great position to manoeuvre it through technical, rocky terrain. The narrow bars allowed me to hold this position well as I didn’t need to use my entire upper body to steer the bike, which in turn had me riding much faster than usual as I didn’t feel like I needed to readjust after a technical section. 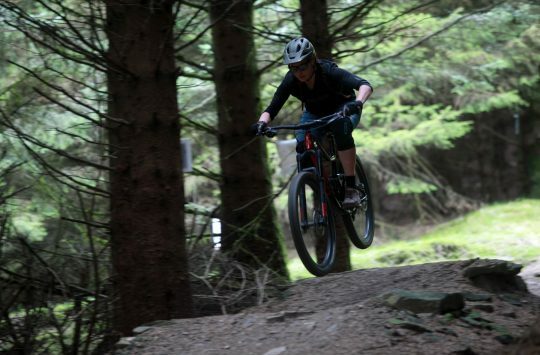 For me I often find that I’m capable of riding really technical features, but not if they’re closely followed by another – I always need that recovery time to get myself back in position and regain control. That wasn’t something I experienced on this bike. Another new experience for me was not feeling so fatigued after a long ride. You may think ‘she only spent one day on it!’, but believe me, it was a long and brutal ride that was led by Ines Thoma and Fabien Barel, and fuelled by not much more than an artichoke salad and half a bottle of red wine (try telling the French you don’t eat meat, then try telling them you don’t eat cheese either!). There’s several factors I think contributed towards this endurance. The most obvious is that the bike is carbon, so it’s much lighter than anything I have previously ridden. I have always made the assumption that you only notice the benefits of a carbon bike when climbing, but on longer descents and manoeuvring it through the deep gullies and over the boulders in Nice, it required less strength and physical exertion to do so. My riding position will also have played a big part in my legs not feeling fatigued. I found myself more upright than usual, putting less strain on my legs and also giving me much more range for getting over the larger features. Also playing a huge role in saving my energy was the fact the bike didn’t lose traction thanks to the finely tuned rear suspension. It’s a very odd (but nice) feeling to not lose speed when rolling and have the bike actually carry me forward. The best way to describe this is often when I’m met with a gravel path my bike gradually slows as it goes over the bumps, much like hitting the sand in Mario Kart. But with the Spectral, traction loss is minimal, so even without pedalling it held speed really well. Clearly the time Canyon has spent developing the three phase suspension platform is noticeable, and it works wonders. While I was initially concerned by the narrower handlebars and shorter reach compared to the unisex version, on the trail, those concerns were never realised for me. The bike was comfortable and easy to ride. 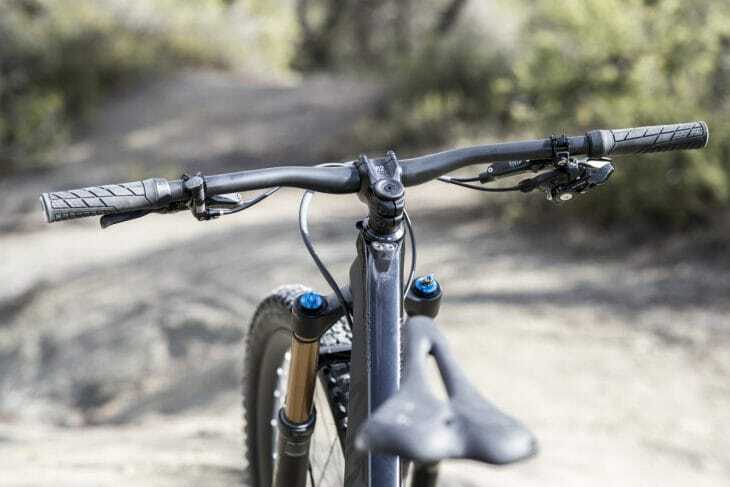 That said, those riders who are on the borderline of sizing like I am may want to look closely at the numbers – particularly more aggressive riders who may appreciate the extra reach and wider bars on the unisex Spectral. That said, it’s rather nice to have the choice in the first place. 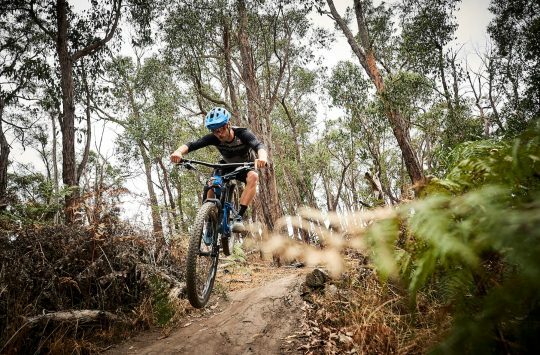 If you want to have great control on both the technical climbs and the descents, and not be too exhausted to keep on going long after your breakfast energy has ceased, then the Spectral may be the all-round trail bike for you. It’s playful when you want it to be but will support you through the roughest trails and comes with a wealth of new technology from Canyon to stand the test of time (and UK weather). I may have only spent 8 hours riding this bike, but it’s already left a lasting impression, and a very big smile. With its own unique frame, geometry and suspension, the Spectral WMN is a slightly different beast to the unisex version. Travel and accommodation were provided by Canyon. The Renthal Fatbar Is Dead! Long Live The Fatbar! tbh it looks better than the unisex one. Its a shame you cant see the comments box from the front page either. 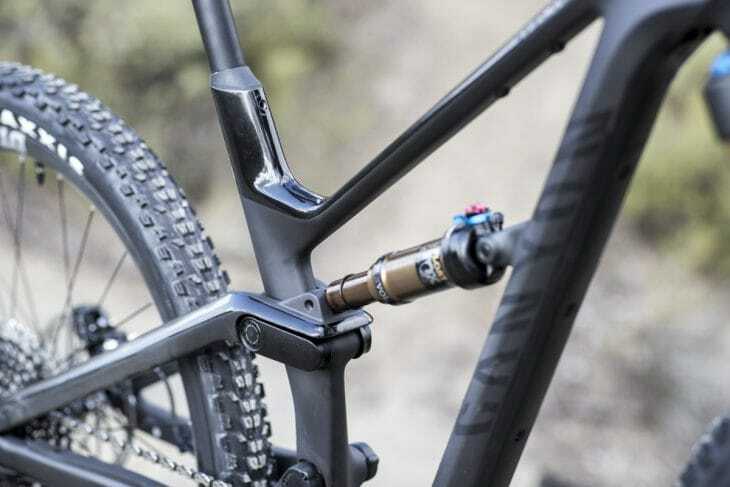 How far can you get the dropper post into the frame / drop the seat down? This looks like it could be further than most bikes, which would be a big step forward. No XXS in carbon though. Shame. I took the women’s Medium spectral for a spin after taking the men’s Large out, as they didn’t have the Men’s in a M. I’m 5’9″. I thought it was brilliant although a tiny bit short. Men’s Medium is 11mm longer in the top tube.